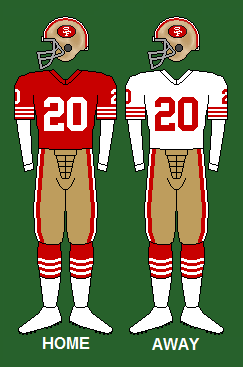 The 1984 49ers became the first team to win fifteen games in the NFL's regular season since the league went to a sixteen-game schedule in 1978. The 1985 Chicago Bears, the 1998 Minnesota Vikings, the 2004 Pittsburgh Steelers, the 2011 Green Bay Packers, and the 2015 Carolina Panthers would later join the 1984 49ers to finish 15–1, although the 2007 New England Patriots would exceed this feat by finishing the regular season at an unbeaten 16–0. ↑ "1984 NFL Pro Bowlers". Pro-Football-Reference.com. ↑ "1984 NFL All-Pros". Pro-Football-Reference.com. ↑ "1984 San Francisco 49ers starters and roster". Pro-Football-Reference.com. Retrieved March 1, 2015. 1 2 3 4 5 6 7 8 9 10 11 12 13 14 15 16 17 18 19 San Francisco 49ers 2015 Media Guide. San Francisco 49ers. p. 451.